COMBINED SULPHUROUS ANHYDRIDE: 22 mg/l. TOTAL SULPHUROUS ANHYDRIDE: 25 mg/l. TOTAL ACIDITY (TARTARIC): 4,75 g/l. VOLATILE ACIDITY (ACETIC): 0,49 g/l. SIGHT: Dark garnet wine with purple tones. Surface satin, velvety. Free dyeing, Noble of bright, clear appearance. Oily, glyceric and dense. NOSE: Wine with good aromatic intensity, typical of this variety. Powerful aromas of blackcurrants, forest fruits, ripe fruits and jams. The tertiary aromas of the wood improve the nose softening the alcohol with toasted aromas. MOUTH: Sweet wine, powerful in mouth and aftertaste, intense in nuances. Spicy woods, cloves, Cinnamon and cocoa, are mixed in the mouth. Tannin sweet and tasty. All in all a very special wine. AGE OF THE BARRELS: 2nd year. DATE OF BOTTLED: August 2017. 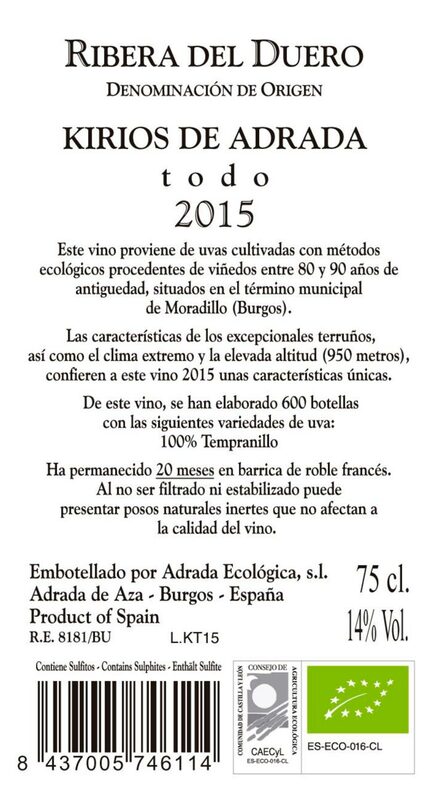 AGE OF THE VINEYARDS: 70 – 100 years. SURFACE AREA OF VINEYARDS: 2,5 Hectares. SOIL: Deep siliceous soils, with a Sandy, loamy texture. ALTITUDE: 900 – 1.100 meters above sea level. BOTTLE: 75 cl Bordeaux Stylus. Height: 325 mm. Colour: moss. PRESENTATION BOX: Vaulted cardboard box. Capacity: Six 75 cl bottles.